Subaru has unveiled a new XV concept car at the 2016 Geneva International Motor Show. 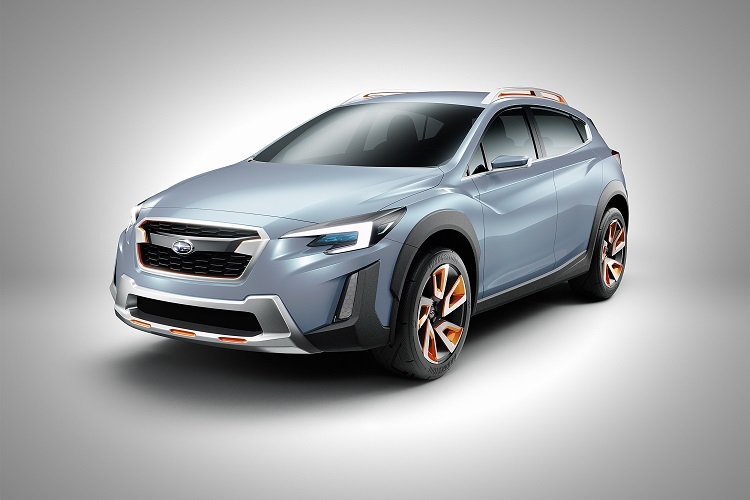 The XV design concept embodies Subaru's next-generation “DYNAMIC X SOLID” design philosophy in a compact crossover model, previewing the direction of the next-generation Subaru XV. It features distinctive character lines on the compact hatch body shape and - in keeping with the essential functionality of Subaru design - offers excellent aerodynamic performance, teamed with the ample road clearance and luggage space required of a crossover vehicle, achieving the optimum blend of function and style. Matte-black cladding emphasizes the crossover character. It runs from the front bumper over the wheel arches and side sills to the rear bumper. Orange highlights on the front grille, front and rear bumpers, alloy wheels, and roof rails, accent the exterior. The Subaru look is evident in the wide and low stance, and in the unified three-dimensional structure extending from the classic Subaru hexagonal grille to the hawk-eye headlights. The inflection of the character line extending from the front guard to the door panels and rear shoulder, and the line rising toward the rear from the lower door panel, give dynamism to the body surface. The rear combination lights share the same motif as the headlights. The powerful shoulders over the rear guards link with the rear lights, highlighting the wide and low stance similar to the front.